HR policy is about having and effectively communicating a framework of guidelines or rules that set out the processes and procedures relating to the people in your business. Policies can be used to explain what is expected from employees in terms of their work, hours, performance and conduct – both in the workplace and whilst out on business. They can cover expenses, benefits and performance management, as well as encompassing equality and access statements. As well as ensuring that you and your people have a clear, shared understanding of the company processes and procedures that may affect them, strong, well-worded and appropriate policies also send a clear signal to employees that you take their management and welfare seriously. 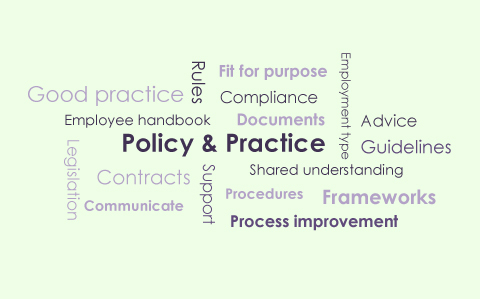 GrantaHR can offer professional advice and guidance on all the processes, documentation and contracts that collectively form your HR policies and procedures, ensuring that everything is legally compliant, is fit for purpose and fits your company culture. Whether you have no clearly documented HR policies, need to introduce additional ones, or simply want to bring existing policies and practices up to date, we can work with you across the whole spectrum. If you would like to know more about these or any other aspects of HR policy and practice, please contact us or ask about our free HR Health Check. © GrantaHR 2019. All Rights Reserved.